Summer is great; more hours of sunshine, warmer temperatures, less clothing, BBQ dinners, nights on the patio, wearing sunglasses, eating gelato, going on holidays, swimming in the ocean, watching fireworks …need I continue? With this advent of sunny weather, and the resultant increase in endorphins, comes an inevitable change in the beers we want to stock in our fridges. Out are the ‘winter warmers’, the dark porters, strong barley wines and robust stouts that warm us from the inside out while providing a days’ worth of calories, and in are the fruit beers, the IPA’s and the lagers. Lagers are probably the most common style of beer in the world in terms of sheer quantity. Quite arguably the quintessential summer drink, and long the staple of ballparks and stadiums, lagers range in colour, hopiness and strength but share the defining characteristic of being fermented and stored at cool temperatures. In its perfect form (to me anyway) lagers are light bodied, crisp and refreshing; something you can drink ice cold and something that is safe to consume in multiples. As always, I would like to give some background so you can to get to know your lagers a little better. According to Randy Mosher in Tasting Beer, the origin of lagers is somewhat murky but generally the story goes that brewers in Bavaria were perfecting their craft by fermenting beer in natural caves or cellars dug into the limestone hillsides. Gradually, a new yeast strain emerged adapted to this cold weather brewing process. Flash forward five hundred or so years and Bavaria style lagers, and brewing practices, were transported to the New World with German immigrants. The first lagers being produced in North America were dark brown beers and probably had little resemblance to the straw gold brews we have come to know today. We have Anton Schwartz, a brewing scientist, to thank for developing the cooking technique in the 1870’s, which afforded the use of lightening ingredients such as corn and rice. Couple with this the development of machine bottling and refrigeration and the stage is set for the birth of the modern lager. In terms of taste, cold-temperature and long fermentation times means less (or no) fruity esters in the beer, which ideally produces a clean, crisp taste focusing solely on the malts and hops. One of the great things about lagers is this simplicity; with only the choice of malt and hop determining the flavour profile subtle characteristics can emerge in the beer from honey and caramel to mint and herb. Mosher suggests that for this style any hint of fruitiness may indicate a too-warm fermentation temperature but subtle sulphur or DMS notes may be acceptable. Some of the styles falling under the lager umbrella include: Pilsners, American Lagers, Malt Liqour, Dunkel, Oktoberfest, Bocks, Rauchbier and many other variations within. When you think about the vast range of tastes and appearances represented in these styles it is pretty amazing to believe all these beers are classified as lagers, a style essentially defined by a couple of strains of cold-temperature tolerant yeast! Rate Beer – Mikkeller The American Dream, Pretty Things Lovely Saint Winefride, Pilsner Urquell Kvasnicový, Ayinger Celebrator Doppelbock, Avery The Kaiser Imperial Oktoberfest, Dogfish Head Liquor de Malt, Surly SurlyFest, The Bruery Humulus Lager. 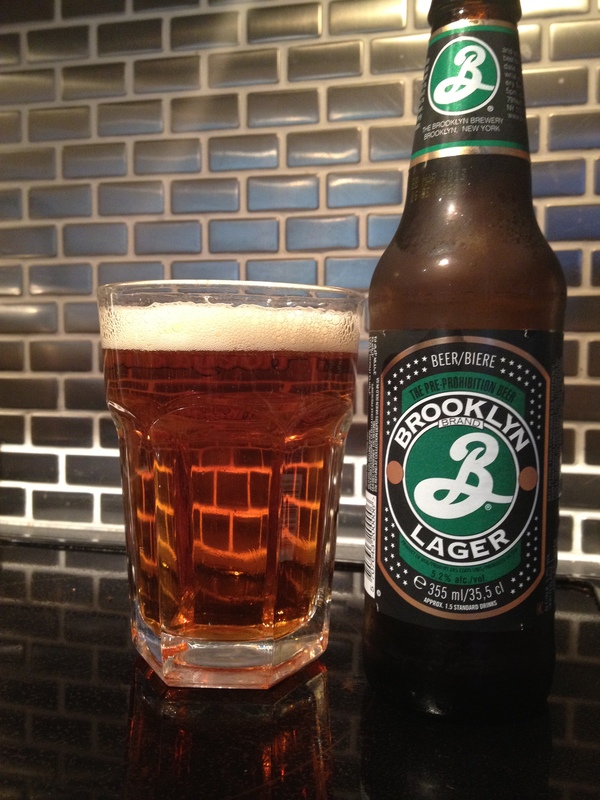 Brooklyn Lager pours clear reddish gold with lots of off-white head that lingers. Slight carbonation in the glass. 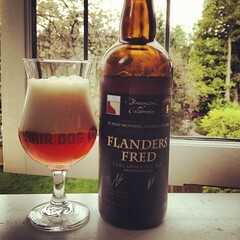 Sweet malt on the nose and citrus notes as well. Light bodied and very clean to drink. Taste wise there is some caramel and citrus with a bit of hoppy bitterness at the finish.